MPAA: Rated R for pervasive crude and sexual content, strong language, drinking, some drug use and a fantasy/comic violent image - all involving teens. Starring: Jonah Hill, Michael Cera, Christopher Mintz-Plasse, Bill Hader, Seth Rogen, Martha MacIsaac, Emma Stone, Aviva, Joe Lo Truglio, Kevin Corrigan. Plot: Two co-dependent high school seniors (Hill and Cera) are forced to deal with separation anxiety after their plan to stage a booze-soaked party goes awry. My Thoughts: In a year filled of really bad comedies Superbad proved that there is still some creativity in the comedy genre. Because if you, like me have seen horrible movies like Date Movie, Epic Movie, RV, Deck the Halls, you would have felt a little dumber after watching it. I could go and on with the list but I don't want to waste your time hearing it. 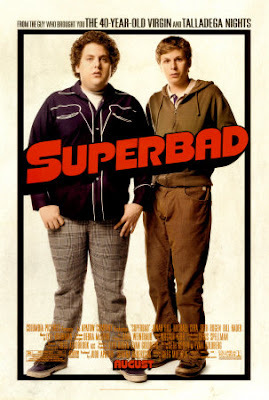 But I will say that this year was a surprise for me when I watched Superbad because I thought it was going to be another teen comedy with the same recycled jokes being used since the mid-90's. But it wasn't, in fact I think I enjoyed this movie more than any other Comedy this year. The only one they can come close is Knocked Up, which both have Seth Rogen and Jonah Hill in them, now these two actors I must admit are proving to be big timers in Hollywood. With nothing but success after success in the movies there in. the story seems harmless, and weak at first, but trust once you start watching you'll see that this is no harmless nor weak comedy that is a rollercoaster ride of laughter from start to finish, and that every actor gives it there all and succeed in doing so. The storyline is about a two friends Seth (Hill) and Evan (Cera) that have been best friends there hole lives, and if you didn't know any better you'd think there were brothers. So after spending their high school doing everything together they are about to say goodbye as there will so graduate and go to different colleges. But taken that they spent all those years as virgins Seth comes up with a plan to lose his and his best friends virginity before they go to college, by becoming the booze suppliers for Jules (Stone) party, which Seth has had a crush on for a long time. And hopes that if he can get her drunk enough he can be the late night mistake that all drunk party girls remember. And hopefully he can make her his girl friend for the summer. But the only problem is they don't know how to get the booze for the party. Well that's until they find out there other friend Fogell (Mintz-Plasse) gets himself a fake ID saying his name is McLovin and he's from Hawaii. Well things become a rollercoaster ride for the three of them as they have the wildest night of their lives. Now first of let me say that both Jonah Hill and Michael Cera did a magnificent performance that will have you laughing till it hurts. What I also liked about their acting is they don't try to give you your average big budget Hollywood style performance, but rather acting like themselves and not pretending to be someone else which works out really good. But as funny as they are, their part of the story comes nowhere near as hilarious as Christopher Mintz-Plasse subplot. I mean his Fogell or should I say McLovin will have you laughing until it hurts. Now what I found to be very interesting is this is Christopher Mintz-Plasse first movie ever which I found to very impressive, and that this movie was written and partly based on a true story by actor Seth Rogen and Screen writer Evan Goldberg, they wrote it back when they were in high school that's why the two main characters are named Seth and Evan. And last but not lease Seth Rogen and Bill Hader both gave great performances as the two corky but funny cops the takes there new found friend McLovin on the ride of his life. Final Say: I really enjoyed this movie and must say I don't think I've laughed this hard in a really long time. But mostly I think what made my love this movie a lot was the fact that I was little like the three of them being the kid none notices and always wanting to be that cool kid that gets all the girls, so for me was great because they did what most nerds like me dreamed of doing when they were a teen. I highly recommend it. Also make sure you see the unrated extended cut because it's even funnier.